HPD, Crime Stoppers searching for two suspects in burglary of a SE Houston home. 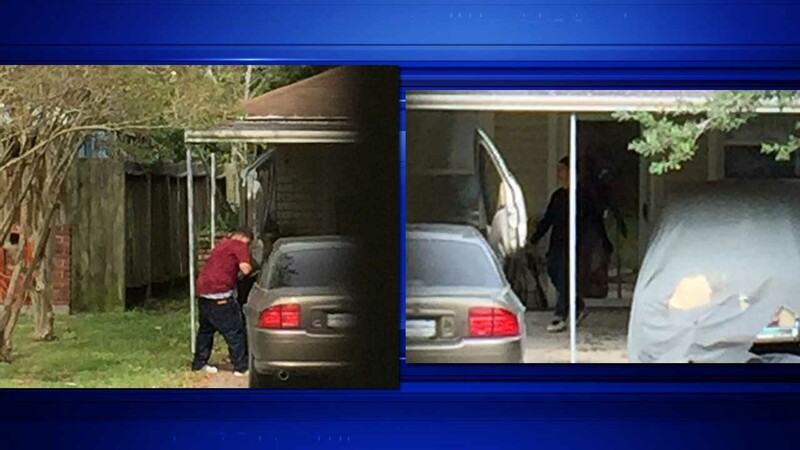 HOUSTON (KTRK) -- Crime Stoppers and the Houston Police Department are asking for the public's help in identifying two suspects responsible for the burglary of a southeast Houston home not open for the public. According to investigators, a home in the 10100 block of Elmhurst Street was burglarized around 12:15pm on November 16. A neighbor was able to spot the getaway vehicle and captured photographs and a short video of the burglary. A shotgun was stolen, two televisions were moved by the suspects and the rear door of the house was kicked-in, police said. The suspects were photographed loading the shotgun into a gray 4-door sedan, possibly a Lincoln, with aftermarket upward-opening driver and front passenger doors. The vehicle had dark tinted windows and it is believed the license plate was a paper tag. The first suspect is described as a heavy set Hispanic male with short black hair, tattoos and was wearing a red t-shirt, baggy blue jeans and white athletic shoes. The second suspect is also described as a Hispanic male, wearing all black with white athletic shoes. The suspects are facing charges of burglary of a habitation. Crime Stoppers is offering up to $5,000 for information leading to the charging and arrest of the suspects in the case. Anyone with information is asked to call (713) 222-TIPS.